The CFCArts Theatre Program is very proud of the selection of musicals, comedies and plays it has to offer for its inaugural season. To make our performances even better for you, we are thrilled to offer our very first SEASON TICKET, which will cover all five of our Theatre Program performances! You can even choose which date you want for each show, so there’s no being stuck with the same day of the week for all 5 shows! All shows will be held at CFCArt’s central campus (which is located on the grounds of Central Christian Church, 250 SW Ivanhoe Blvd., Orlando, 32804), EXCEPT “The Crucible,” which will be located at The Venue, 511 Virginia Dr., Orlando, 32803. Tickets for Friday, Saturday or Sunday tickets for our CFCArts Theatre Program performances are regularly $15 online or $18 at the door but if you buy a season pass, the total cost for all 5 shows is only $60 – that’s just $12 per seat! Make sure to order your CFCArts Theatre Program season tickets now because after October 18, they will no longer be available! 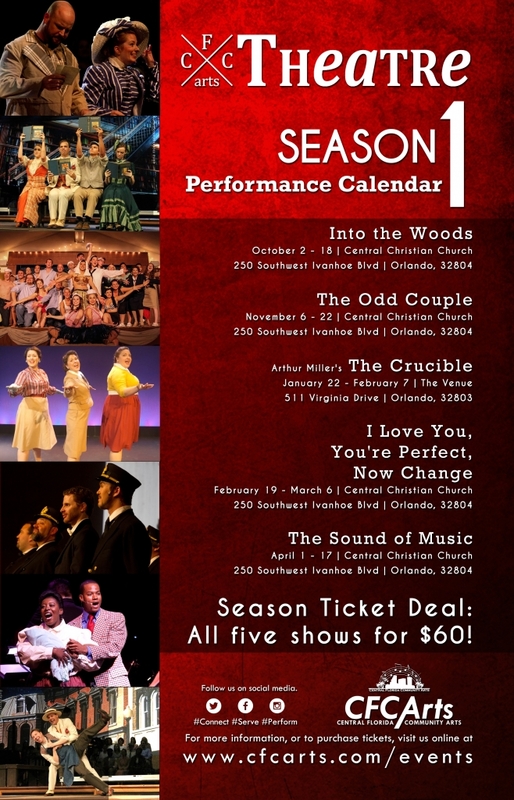 Ready to buy your CFCArts Theatre Program season ticket for just $60? Just click on the green button and get ready to enjoy a whole season of performances!